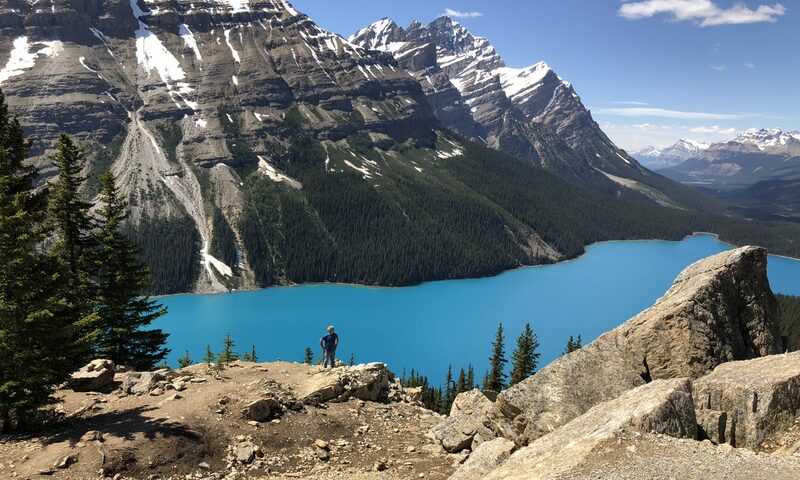 An Overlander recently advised us, “If you make one plan, you will end up with two plans, because plans always change”. We have realized that with Overlander travel, schedules don’t work. The van needs maintenance, the road is closed, documents take days to renew instead of the expected hour or so. And then there is another place just down the road that locals tell us we have to see. Our original plan put us in Peru in February. 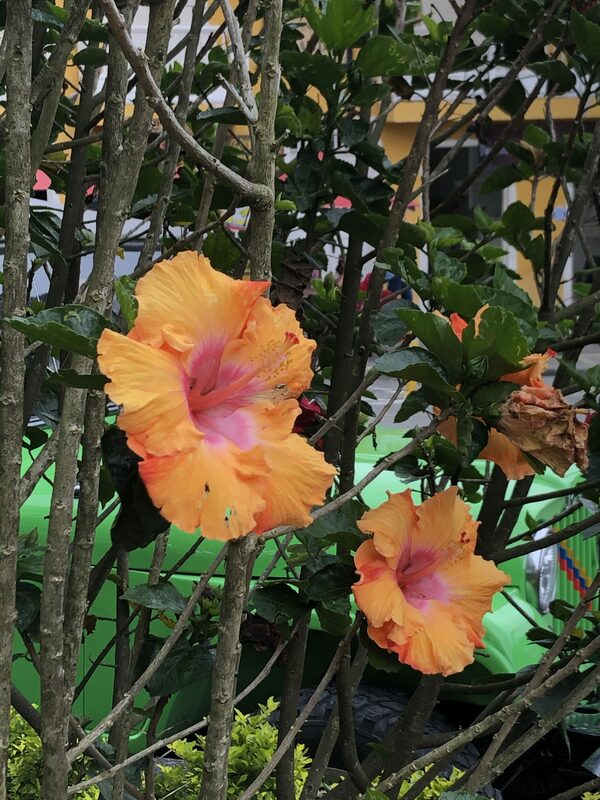 It’s now mid March and we are still in Colombia. 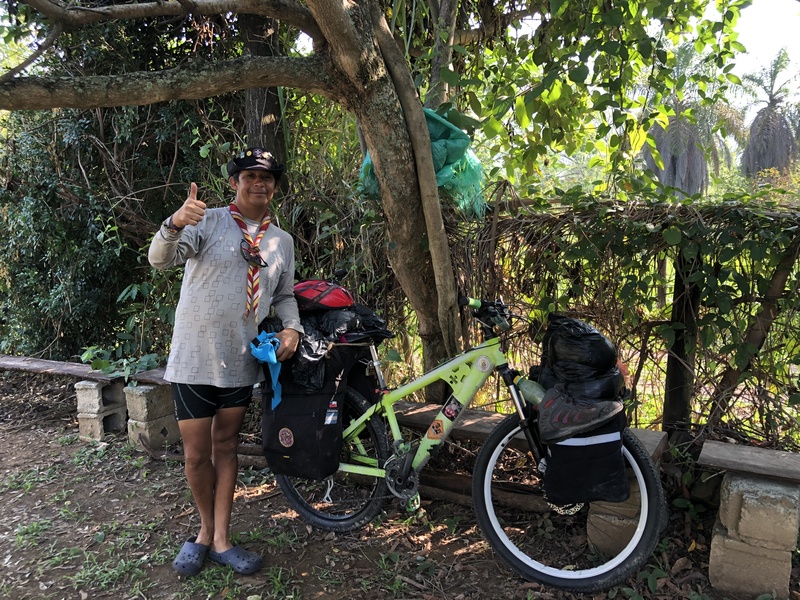 On return to Al Bosque, we stayed three more days, catching up on laundry, renewing the car insurance, and reconnecting with the Overlander gang there. We were sad to learn that Israel and Diana, the enthusiastic Venezuelan volunteers, were about to leave the camp. They had not found employment, and their volunteer time had ended. Millions of Venezuelans have crowded into Colombia, attempting to escape their tortured homeland. Colombia’s resources are taxed with this extra burden. With nowhere to go, Israel and Diana spent the following week sleeping at the bus depot. Last we heard, they had managed to rent a closet sized room with a mattress on the floor. We wish them the best. 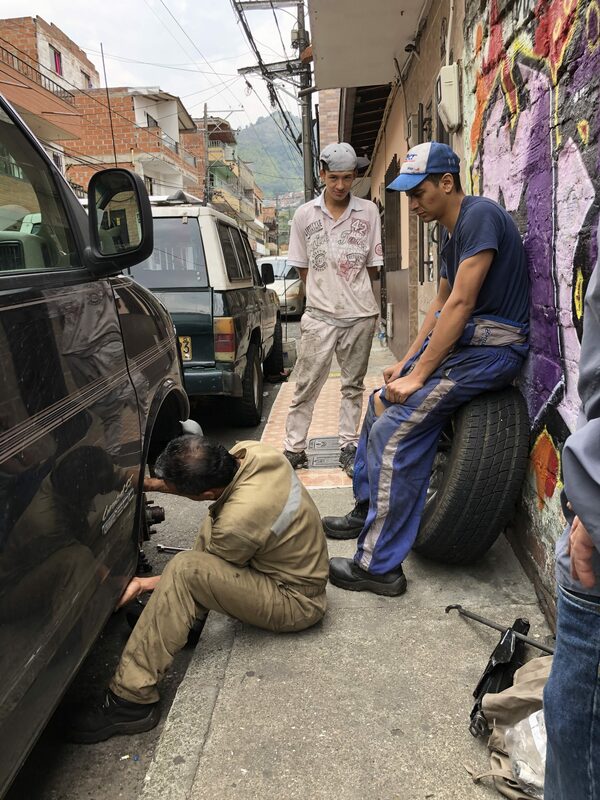 Leaving Al Bosque, we drove into the sprawl of Medellin, in order to connect with the Panamerican highway. It was a one hour drive, downhill all the way. By the time we reached the highway Bob realized that Vanna needed new brake pads. We asked several times for directions to a freno shop, then drove around in the general direction that the hands waved, until we stumbled upon it. The parts department was a little kiosk in one corner of the yard. Four women worked in this tiny space. They all asked questions at the same time, then poured over a large catalogue on the counter, and continued the search on the computer. When they asked if we would like coffee or wine, I figured we were in for a long wait on the parts. But as soon as they served us coffee in those small plastic cups, the parts were set out on the counter. Then the mechanic hurried us back to where the van was parked, and immediately set to work, right on the street. It was completed in under an hour for about $70 Cdn. Including parts. And we were good to go. Colombia is divided into departments. 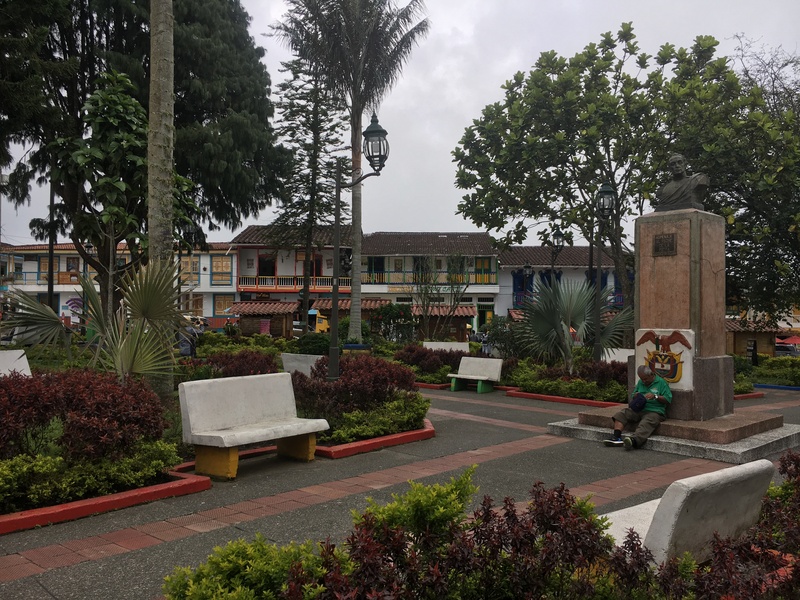 Located south of Medellin, the department of Quindio is known as the coffee region. The air is fresh, and the climate is warm. 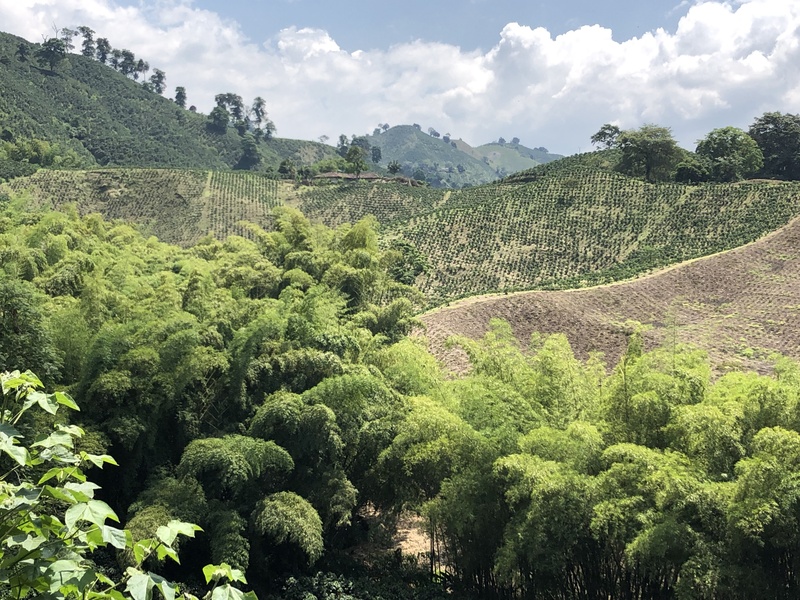 Rolling hills are covered in shiny dark green coffee plants, interspersed with broad banana leafs, and the tall ferny foliage of bamboo. It gets hot during the day, and so for several nights we looked for places to camp that had swimming pools. 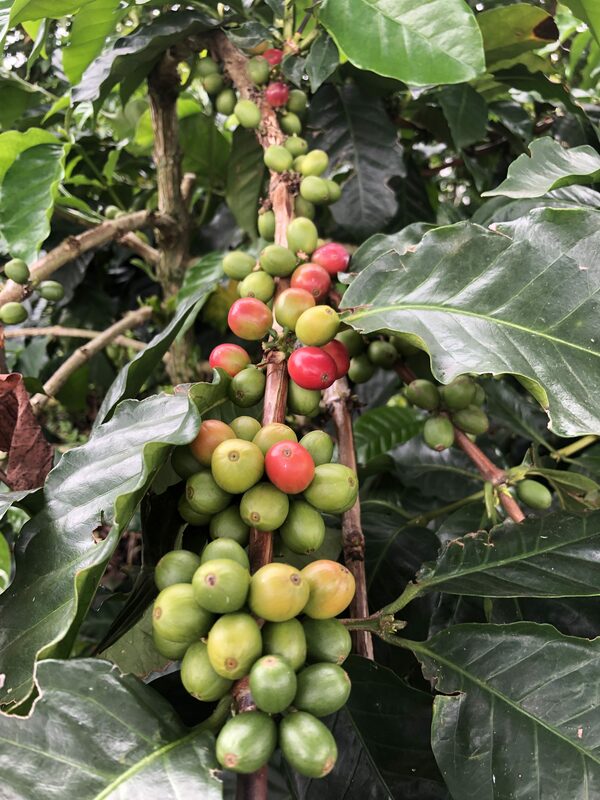 For two days, we camped in the shade behind a hotel, and another day on the grass of coffee plantation. One afternoon, a man rolled in on a bicycle and set up his tent near our van. He was wearing typical cycle clothing, but in addition he wore a Boy Scouts hat and neckerchief. Marcello had left his wife to look after their four children in Chile, while he enjoyed a 6 month road trip. His goal is to cycle to the World Scouts Jamboree, to be held in July, in West Virginia. 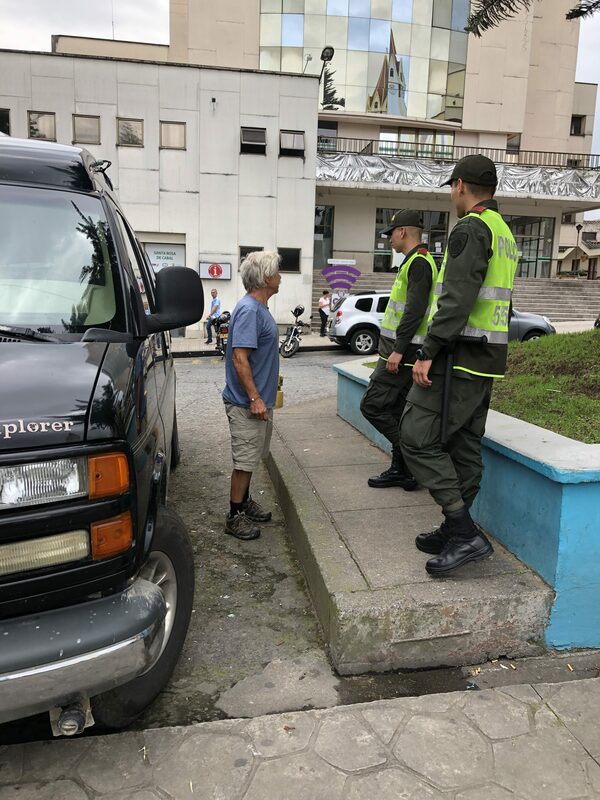 He was short of cash and had no food, so we shared meals with him, while he determinedly tried to converse with us in Spanish. Before he left the next morning, he wore his Scouts hat and carefully strapped his helmet to the load on the back of the bike. Good luck Marcelo. In the small town of Filandia, we drank coffee at a sidewalk restaurant, watching life roll by in rural Colombia. Across the street was the charming central square full of paths, variegated shrubs, flowers, benches and monuments. There were old men in cowboy hats and tall black rubber boots, a wide scarf hanging over one shoulder. School kids freed for lunch, all wearing burgundy sweaters, the girls in plaid pleated skirts with knee high white socks. Parents meeting kids. Couples eating at tables. It was contentful and leisurely. 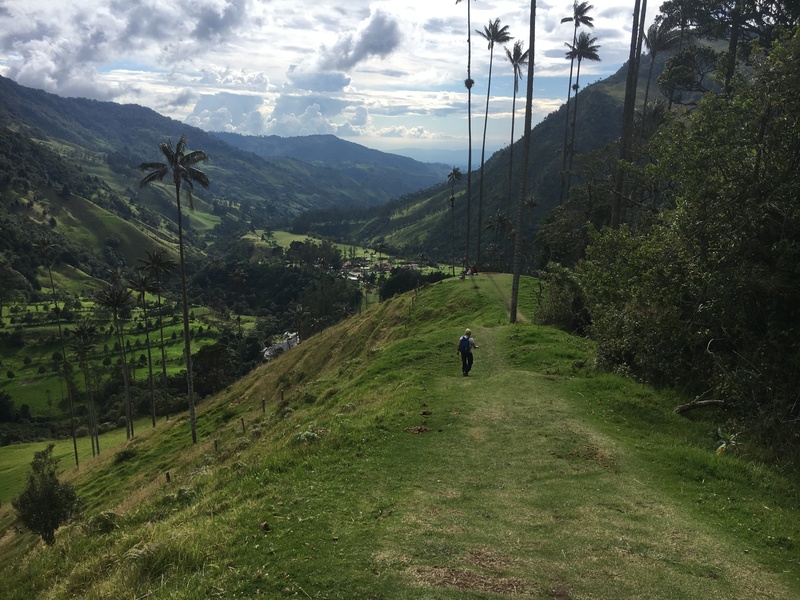 The town of Solento draws tourists because of its proximity to the stunning Cocora Valley. The valley is home to Columbia’s national tree, the wax palm, which can grow up to 200 feet in height. In Solento, we were also introduced to the Willy Jeep. The big colorful vehicles were everywhere. 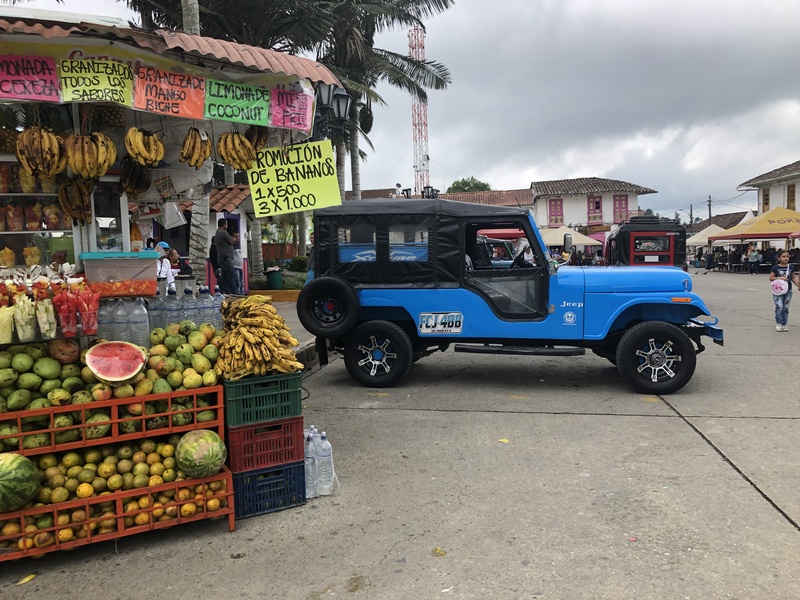 Willys have been used in this coffee region since World War Two, being rugged enough to transport loads over untamed land. Almost everyone who wants to see the valley, goes there in a Willy Jeep. Early one morning, eight of us were stuffed into the back, and a few more stood on the bumper rail, hanging on, as we headed out of town. We were dropped at the trailhead, the start of a 6 hour hike. The trail crossed through pasture, then wound along a stream up into the mountains. 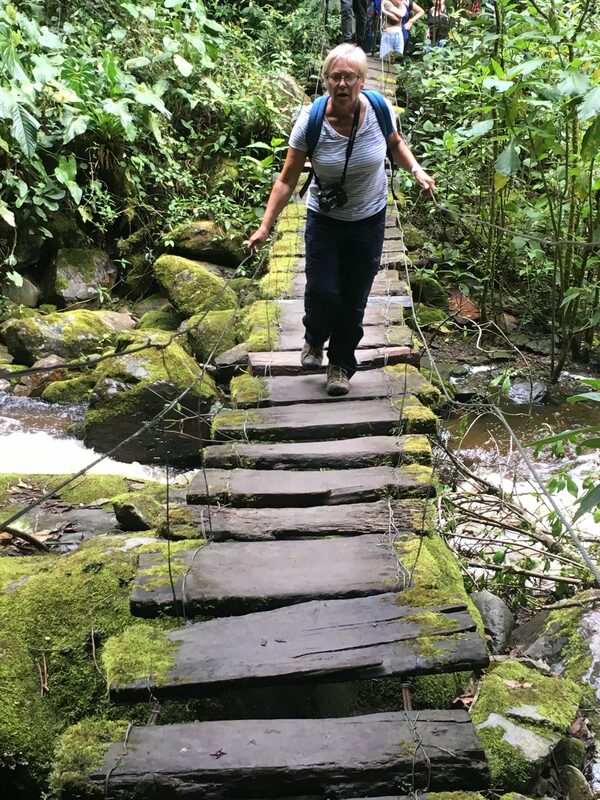 Besides the constant uphill, there were rickety bridges, some with long drops below. The most challenging crossings were made of two slippery logs tied together. Don’t think, don’t look down, just go. 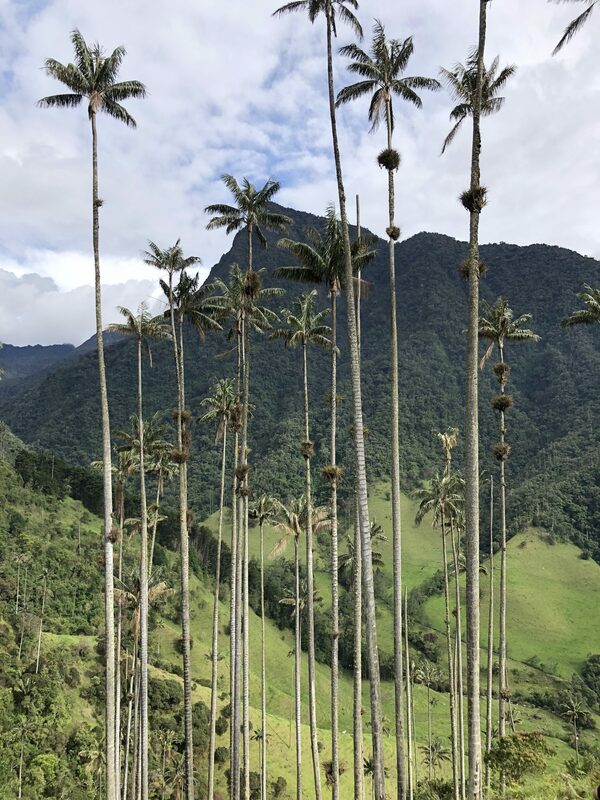 The rewards were the grassy hills where we could sit and stare at wide vistas into the valley, the elegant palms towering over the forested mountain. We also were happy to spot many birds and a few hummingbirds. 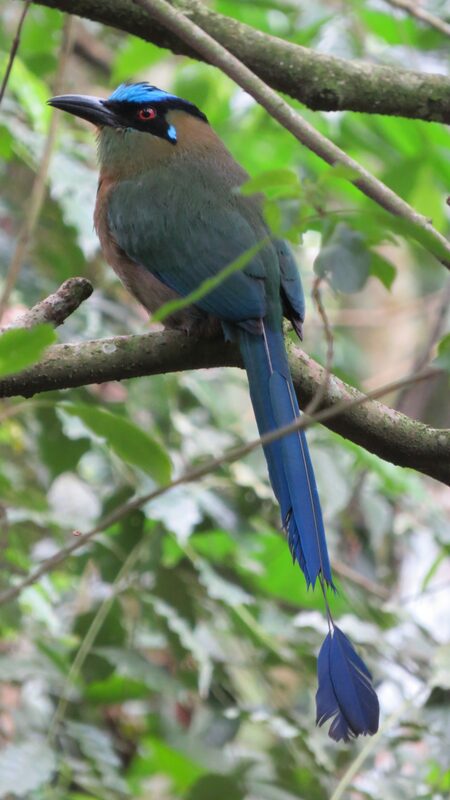 One of our favorites is the beautiful blue Andean Motmot with its unusual 2-part tail. Colombians are friendly, inquisitive, and caring. Many are interested in where we are from, ask to see the van, and give us a hearty welcome to their country. Sometimes with hugs. Driving through heavy traffic in the city of Cali, a woman rolled down her window and yelled, “Where are you from?” Then “Bienvenidos”, as she sped off. The funniest encounter was in Santa Rosa, where a family wanted their picture taken, with me, in front of the van. Then the woman climbed into the driver’s seat and posed while her husband took photos of her. They thought the van was wonderful. 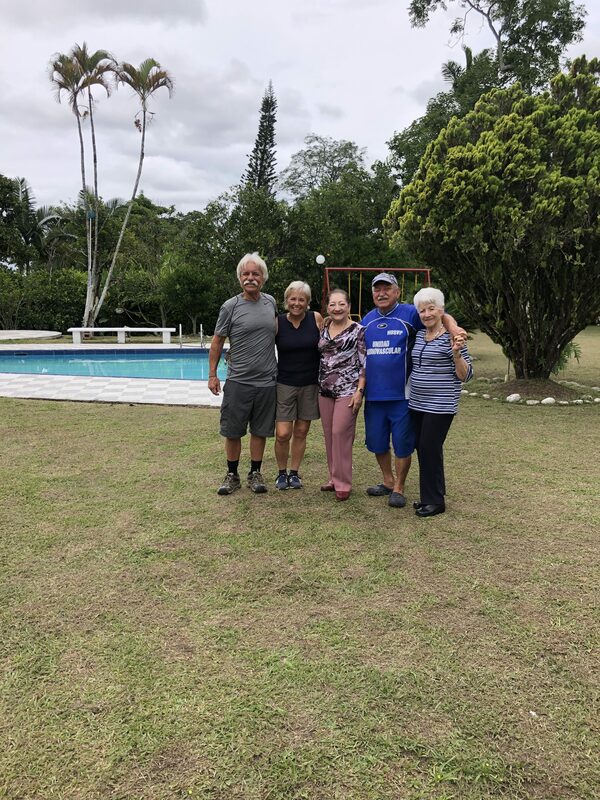 A good friend in Canada, Eliana, arranged for us to stay at her family home in Armenia, the capital of Quindio. Although they spoke not a word of English, her parents doted on us and treated us royally. Their house has 5 bedrooms, with many other rooms going off of an L-shaped hallway. It was so spacious that I kept turning into the wrong room. The large yard had several types of orange trees, mangos, 2 kinds of avocado and other fruits we had never heard of. As well, a beautiful pool, and two dogs named Tony and Andres. Both Emilio and Theresa love to have fun, and in spite of translation issues, we had a lot of laughs with them. 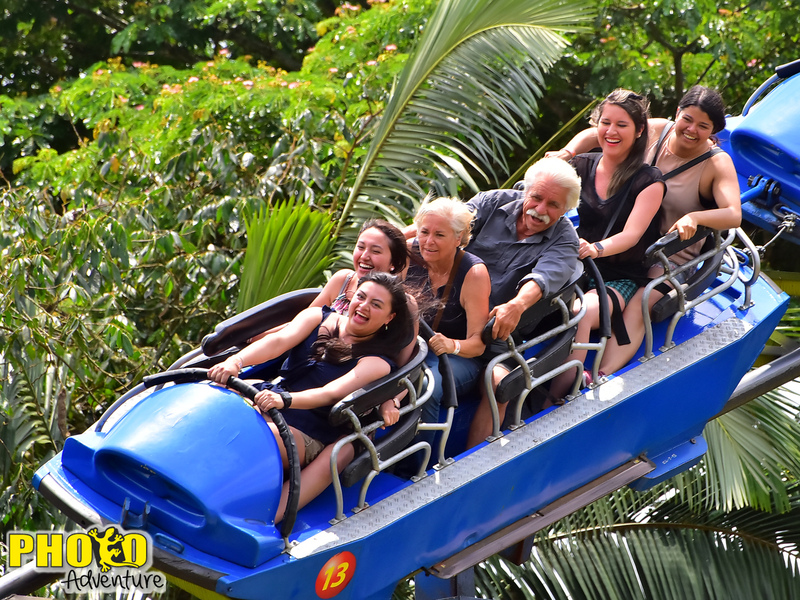 Near Armenia, we had a great day at a coffee theme park called Cafe Parque. We rode the roller coasters and ran the rapids in a little boat, getting absolutely soaked. A highlight was the costume and dance show, outlining the history of coffee production in Colombia. The whole park was clean and beautifully landscaped. Crowds were thin, leaving us with plenty of time to stroll and enjoy the rides and exhibits. The following day was a tough one. It started happily enough. Headed down the Panamerican, we expected to cross into Ecuador within a few days. We were soon stopped for a routine police check, and one guy noticed the crack in the windshield. This was a problem. Other officers came to look and they shook their heads. A serious problem. We were informed that in Colombia it is an offense to have a windshield crack. The fine is 400,000 pesos ($200 Cdn). The jefe ( boss) sternly listed the probable outcomes. Holding Bobs drivers licence in one hand, he tapped it against his other hand while he talked. Tap, tap, tap. Pulling out a fat ticket book, he announced that the van would be taken to the Canadian consulate. “Why?”, I asked. Because you can’t drive in Colombia with a cracked windshield. Oh but you can drive a car that spouts blue exhaust, own a truck that can barely puff its way up a hill, and ride a motorcycle without a helmet. This made sense – NOT. I tried to look unconcerned. “OK, let’s go to the police office”, I said. He put the book away. Then jefe asked about Canadian dollars. When I informed him that they were not the same as US dollars he was surprised. And when I told him that we did not have any “dólares”, he seemed disappointed. Bored with me, he walked off. With no further discussion, Bob’s licence was returned and we could go. Wonders never cease. About an hour later we started to see trees branches on the road, and soon large stones littered the pavement. We kept going. Then we saw a guy in the middle of the road holding a movie camera. We kept going. Suddenly men swarmed down from a hill at the side of the road. They came right at us, wearing green and red bandanas over their faces. For a second I thought, wow we have just driven onto a movie set. It was unreal. But reality gave me a backhand. These were the Indigenous protesters who had blocked the road between Colombia and Ecuador. Ahead we could see a large barrier of branches and stones, a small fire smoldering in the center. We rolled down our windows and attempted a friendly approach. The short conversation went like this. Can we pass? No. What is your protest? We are unhappy with the regulators. But we are just tourists who want to drive to Ecuador. No, turn around and leave. The Plan. 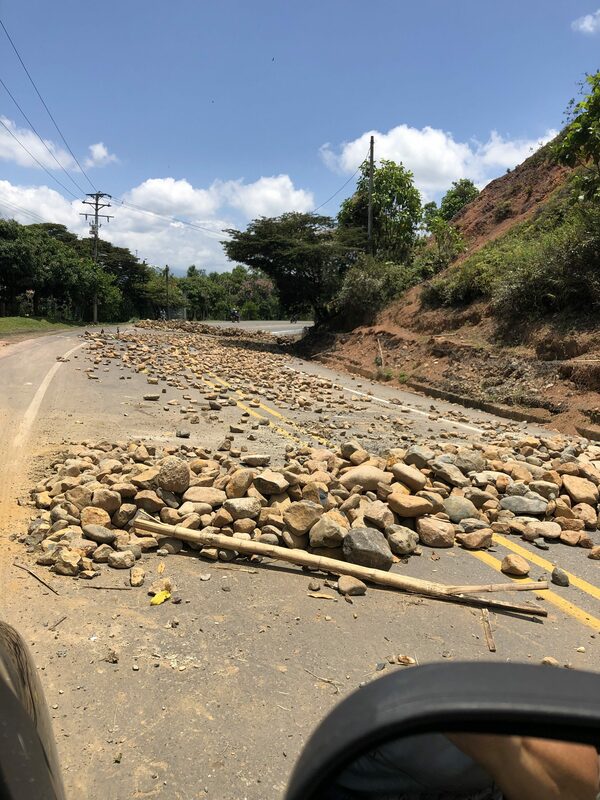 The routes to Ecuador are blocked. No one knows for how long. So I guess we are going to see more of Columbia. That jefe didn’t dare mess with you Joyce, so I bet you could have gotten a shot of the men with the face bandanas! They wouldn’t have dared mess with a pequena mujer feroz! You guys are so observant and kind, and open to adventure and interaction with anyone. Loving your stories, and well done with the corrupt transit police! Fortunately we have not run into many corrupt police. Just enough to get experience for the next one. Haha. Hope to hear where you two are planning your next vacation. Take care. We are driving from Manitoba Canada to Ushuaia Argentina in our GMC Savana conversion van. 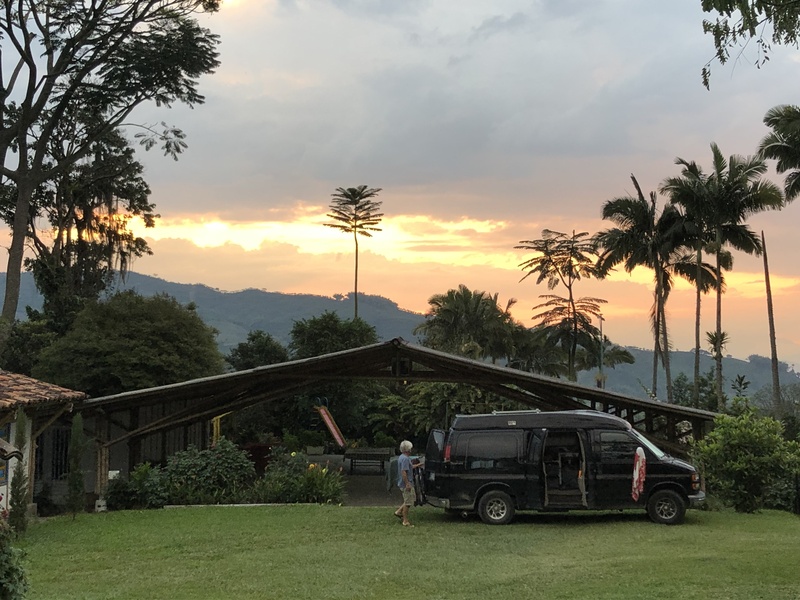 Panama/ Colombia – 45 min flight for us, 3 days by ship for the van. $318 customs fee for us, and TBD for the van.